Janet Martin: Quebec missionary, born as Janet Madeleine Mills in London, England on 18 June 1933 to Basil Mills and Margery Roland. After being raised in a secular setting she was introduced to the idea of Christian faith when evacuated to Wales. After World War II she immigrated to Canada with her parents. Janet came to personal faith in the Harrow Associated Gospel Church and was baptized by them in Lake Erie, Ontario. She later attended Toronto Bible College, where she met fellow student Tilman Martin. They married in Harrow on 6 June 1953. Janet Martin became a member of the St. Jacob's congregation of the Mennonite Conference of Ontario. 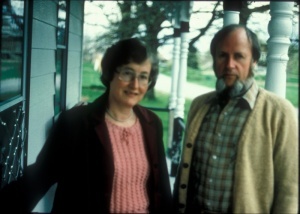 She and Tilman continued their education at Ontario Mennonite Bible Institute. From 1954 on Janet Martin was in full-time service for the church with Tilman — one year in Waters, Ontario and 46 years in Quebec. She and Tilman were the pioneer missionaries for Quebec along with Harold and Pauline Reesor, sent by the Mennonite Board of Missions (Elkhart) and later the Mennonite Mission Board of Ontario. The Martin and Reesor couples arrived in Quebec in August 1956. Janet Martin participated fully in ministries in Montréal-Nord (1957-1973), Joliette, the Camp Le Sablier and in the prisons where Tilman served as chaplain for 15 years. She often opened their home to prisoners on parole or on visits. In fact through their home base Janet Martin provided radical hospitality for children, grandchildren, those revolving around the church and others in need. Janet Martin spent her retirement actively engaged in the Ottawa Mennonite congregation. She had five children, one of whom died young. Janet Martin died in Gatineau, Quebec on 29 July 2002. Martin was a pioneer missionary, musician (particularly solo vocals), and correspondent in French for l'Aurore newspaper and in English for The Canadian Mennonite. Janet Martin served as longtime liaison between Mennonite Church Eastern Canada and the Quebec churches. As a historian she collected enough documents to provide a beginning for the archives of the Société historique Mennonite du Québec. Canadian Mennonite 6 (7 October 2002): 19. Fines, Hervé. Album II du protestantisme français en Amérique du Nord. Montreal: L'Aurore, 1988: 66-69. Lougheed, Richard. "Martin, Janet Mills (1933-2002)." Global Anabaptist Mennonite Encyclopedia Online. February 2008. Web. 24 Apr 2019. http://gameo.org/index.php?title=Martin,_Janet_Mills_(1933-2002)&oldid=142181. Lougheed, Richard. (February 2008). Martin, Janet Mills (1933-2002). Global Anabaptist Mennonite Encyclopedia Online. Retrieved 24 April 2019, from http://gameo.org/index.php?title=Martin,_Janet_Mills_(1933-2002)&oldid=142181. This page was last modified on 1 January 2017, at 21:44.